Dorflinger’s “Brooklyn Star” Motif Revisited: Its Story Can Now Be Told! Home » Dorflinger’s “Brooklyn Star” Motif Revisited: Its Story Can Now Be Told! A couple of years ago, when the expression “Brooklyn star” was investigated by the writer, he assumed that this was a historically valid term, one that was applied to a unique type of star. He spent a considerable amount of time attempting to discover what it looked like, but he failed because he was wrong in his assumption. No such star exists. While doing this research he, nevertheless, discovered two distinctly different star designs, both of which are referred to as the “Brooklyn star” in the literature. Neither sports a unique design, however, and neither is especially historical. Both motifs are sometimes labeled “Brooklyn star” only because the people who first used this name failed to realize that each motif already had an acceptable name. As a result, there has been considerable confusion among collectors and others. The conclusion reached by the writer in this file’s predecessor — that “the ambiguous term ‘Brooklyn star’ be avoided” — is still appropriate. After reading the following account, it is hoped that the reader will agree. pair of rays. A sketch is shown on the right. J. Michael Pearson is credited with the name, a name that has been in use since at least 1978. The motif is analogous to the flashed fan and the flashed hobstar, terms that Pearson was using as early as 1965. Although its wording is ambiguous, this statement can be assumed to describe a flashed star (a.k.a. “Brooklyn star”) when it is realized that the “five deep broad cuts” refer to the star with ten points that is illustrated in The Glass Club Bulletin, No. 160, p. 11. That star is flashed with seven-ribbed fans, however, not “three to five”, which can be thought of as an option used in other examples. Although Barbe and Reed recognize that this star “was also cut in the base of White Mills pieces, particularly in the early period [i.e., 1867 and later]” they, unfortunately, fail to mention that it was also used by other manufacturers. Jane Shadel Spillman, of the Corning Museum of Glass has concluded that “this foot design . . . cannot be taken as a guarantee of either date or origin” (Spillman 1996, p. 204). Although Spillman herself uses the term “Brooklyn star” instead of flashed star in her account of the American cut-glass industry, she chose the term because she reasonably “thought it was in common use among collectors and would be easily understandable.” True enough, but, unfortunately many collectors probably would not immediately think of Barger’s “Brooklyn star” when hearing the term. They would, instead, visualize a second “Brooklyn star” which is better known. This second star is discussed in the second half of this file. Barger was, and is, relatively unknown in cut-glass circles. Her publications seem to have been limited to local newspapers and, consequently, have not circulated widely. 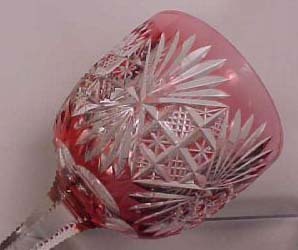 The flashed star was used on the feet of decanters, compotes, celery vases, and other items in the table service which was produced in Booklyn in 1861 by the Dorflinger Glass Company for the Lincoln White House (Spillman 1989, pp. 66-79). But no evidence exists that this company was the originator of this type of foot. A superficial search has found the flashed star in use as early as the 1830s in England (Hajdamach 1991, pl. 40), although it could have originated on the continent. 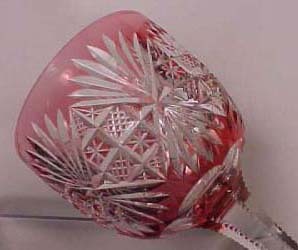 By this date cut-glass motifs were international, and the more popular designs were widely copied. It is clear that English cutters were familiar with the flashed star long before the Lincolns ordered their tableware. The stemware Dorflinger made for the Lincolns has feet cut in a pattern that is markedly different than the flashed star. A sketch is shown on the left. The reader can find several actual examples in Spillman’s comprehensive account of WHITE HOUSE GLASSWARE (1989). Feller, who shows a champagne glass from this service, calls this cutting “star and fan” (1988, p. 194). Because this design is so unusual, it is tempting to suggest that Barger had this design in mind when she used the term “Brooklyn star”. This suggestion is not valid, however, if one accepts Barbe and Reed’s description of the “Brooklyn star” given above. Like the flashed star, the “star and fan” foot was not cut exclusively by Dorflinger. It is not often found. The second “Brooklyn star” is shown in the third edition (1996) of IDENTIFYING AMERICAN BRILLIANT CUT GLASS by Bill and Louise Boggess, from which the following quotations are taken. They could have appeared in earlier editions of this book, 1984 and 1990, but neither was available to the writer. The Boggesses state that “the craftsmen” called the motif the “Brooklyn star”. If the term were used by them — and we have only the Boggesses’ word for it — it was probably used casually, in the day-to-day operation of a cutting shop. When and where this occurred are questions that probably will never be answered. This situation seems highly unlikely to the writer. It is even more unlikely that the Parisian pattern “introduced” the “Brooklyn star”. This pattern was not cut until the mid-1880s, long after Dorflinger had ceased its activity in Brooklyn. How could the Parisian pattern introduce a motif that supposedly was in production twenty years earlier? Actually, the Boggesses’ “Brooklyn star” is nothing more than a flashed double-mitered hobstar, a motif that was undoubtedly known to the authors, but one that lacks the romantic interest of an early glass factory, the Civil War years, and the borough of Brooklyn. The Boggesses’ book is still in print, and it sells well. Therefore, readers are likely to find this particular “Brooklyn star” haunting venues such as eBay for many years to come. 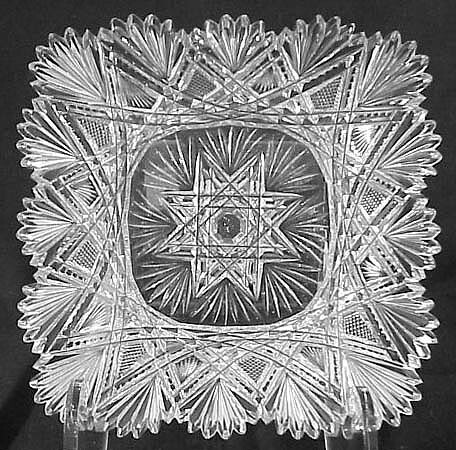 The square dish shown here is especially interesting because it displays the Parisian pattern twice — along the dish’s sloping sides and, in greatly restricted form, in the bottom of the dish, the so-called “Brooklyn star”. If one were to expand the “Brooklyn star” one obtains the Parisian pattern shown on the sides. Skrink the Parisian pattern and one gets the “Brooklyn star” — the flashed double-mitered hobstar — in the bottom of the dish, adjusting, of course, the number of points on the hobstars in each case. That is, as illustrated, the Parisian pattern on the sides of the dish has 16 points; the rudimentary Parisian pattern in the bottom of the dish has as half as many. The Parisian pattern’s patent-drawing, incidentally, has a 24-pt hobstar, with a single star on its hobnail, in place of the flashed double-mitered hobstar. The entire Parisian patent — an important contribution to the American cut-glass industry — is analyzed in detail elsewhere. If one glances ahead to the images, he will notice that the writer has played a trick on the reader in order to illustrate dimorphism: The digital image of the hock glass, below on the left, has been “flipped” horizontally, using Photoshop, with the result that there are two images, with the glass on the right a mirror image of the glass on the left. While this case of dimorphism should, perhaps, be called “creative dimorphism”, it does illustrate the writer’s point. In these two illustrations of Dorflinger’s Royal pattern the positions of the star and the strawberry (fine) diamond, or crosshatch, motifs are seen to be reversed. Surprisingly, both of these arrangements can be found in the ACGA DORFLINGER catalog (1997) where they are both labeled Royal. For example, on p. 17 a goblet and a wine glass match the hock glass shown on the left, while a saucer champagne matches the hock on the right. Moreover, the three glasses are standing together in close proximity for their group photograph! Because two slightly different versions of the Royal pattern were available — but were not identified as such — one wonders how a person would order an exact replacement for a glass that was shattered. Two images of a hock wine glass that demonstrate dimorphism (see text). The Royal pattern by C. Dorflinger & Sons on shape no. 520. Red cut-to-clear. H = 4.6″ (11.7 cm), rim D = 2.75″ (7.0 cm). A dozen of these glasses cost $38 in the 1890s. The single hock glass illustrated here sold for $481 at an eBay auction in 2003 (Image: Internet). Although digital editing makes it easy to fake dimorphism, the printing of the “wrong” side of a film negative will give the same result. This is what was done on p. 117 in the book RARITIES IN AMERICAN CUT GLASS. The purpose was not to display dimorphism, but to present “a pair of very fine ‘Harvard’ pattern lamps” when only one was available (note 2)! The Royal pattern was probably introduced before 1890, possibly c1887. This date is suggested by the close resemblance of the pattern — and Dorflinger’s Star and Diamond pattern as well — to Clark’s “Strawberry Diamond and Star” pattern which was patented in 1886 (note 4). The name Royal may have been chosen as an acknowledgment of Queen Victoria’s Golden Jubilee of 1887. The Libbey company made this acknowledgment in the naming of its Victoria pattern (1887). 1. Evans, Bill, 1994: Desperately seeking “Devonshire”, The Hobstar, Vol. 16, No. 9, pp. 1, 6-8 (June). 2. The authors, Herbert Wiener and Freda Lipkowitz, used an even more obvious technique on p. 39 where a single candelabra has been made to do the work of two. Its photograph was simply printed twice: side by side. These shenanigans are not a complete surprise. The book’s senior author was sued in 1988 for selling fake American brilliant cut glass. The lawsuit was eventually resolved under a confidential settlement. An in-depth account of this scandal has been written by Ian Berke as “Problems in Cut Glass” and published in the Maine Antique Digest, issue of March 1990, pp. 26-A to 29-A. The article contains useful information concerning new glass that has been (is being?) sold as old glass. 3. In the photographs and drawings that accompany U. S. patent applications either the cut side or the uncut side is illustrated; there is no preference. In a few instances, both sides are represented. 4. In the earliest reprinted Dorflinger catalog, found in the ACGA’s compilation of 1997, the Royal pattern is shown in a section dated c1886. But this date is too early by at least two years because this section also contains the Florentine pattern which was not patented until 1888.